Nielsen is doubling down on its diversification into digital audience analytics, announcing a deal this morning to acquire Visual IQ, a highly regarded provider of so-called “multi-touch attribution” used to measure consumer reach across “channels” and devices. Terms of the deal were not disclosed, but it comes two years after Nielsen made a big push into digital audience attribution, acquiring eXelate, a leading “data management platform,” or DMP, used by brands and agencies to target segments of consumers across digital media platforms. Nielsen reportedly paid $200 million to acquire eXelate in March 2015, and while the company continues to operate as a free-standing service, its data, software and systems have also been integrated into Nielsen’s offerings. At the time, some observers saw Nielsen’s acquisition of eXelate not just as a diversification play, but as a hedge against a future in which brands rely less on sample-based audience estimates that have been the cornerstone of Nielsen’s business to one in which they leverage analytics about consumer media behavior to ascribe or attribute audiences and reach. Since that time, many of Nielsen’s biggest traditional media customers -- notably major television networks -- have created their own DMPs and audience data analytics tools to create more “people-based” targeting. 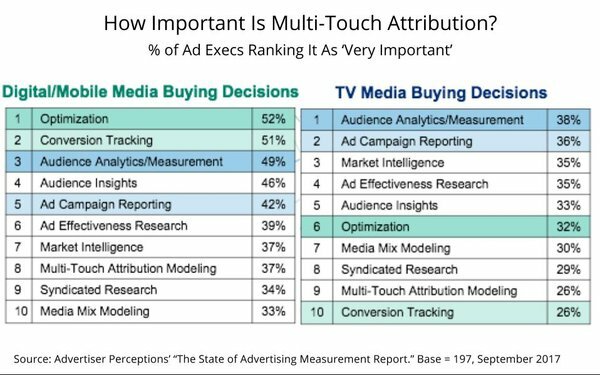 Interestingly, the deal comes as advertiser and agency sentiment in multi-touch attribution systems appears to be piquing. Coincidentally, a survey of advertisers and agency executives on the state of ad measurement released this morning by Advertiser Perceptions, found 37% regard it as “very important” in their digital media-buying decisions, although only 26% felt the same way about their TV media-buying decisions. 1 comment about "Nielsen Doubles Down On Digital, Acquires Visual IQ". Tim Hanlon from The Vertere Group, LLC, September 27, 2017 at 12:31 p.m.